It is the students…dressed in their best, because going to an Auburn game is like going to church for Auburn people…. Those students remind you of the days when you were walking in their shoes and Auburn was your home…but then you realize, in many ways, it is still and always will be HOME. It is knowing that year after year, no matter how things change in our hectic lives, you can always come back to “the Loveliest Village on the Plains”…the place where you came from…your home. It will probably look a little different and there will be new names on the backs of the jerseys, but deep down, no matter what, it is still the same. You still love it as much as you always have, because Auburn is as much a part of you as your arms and your legs and the orange and blue blood that runs through your veins. I am pleased to share the annual report of the Auburn Alumni Association’s 2016-2017 year. It was a year of goals achieved and surpassed. It also was a year of inclusion – of Auburn relationships renewed and made through our alumni association’s efforts. 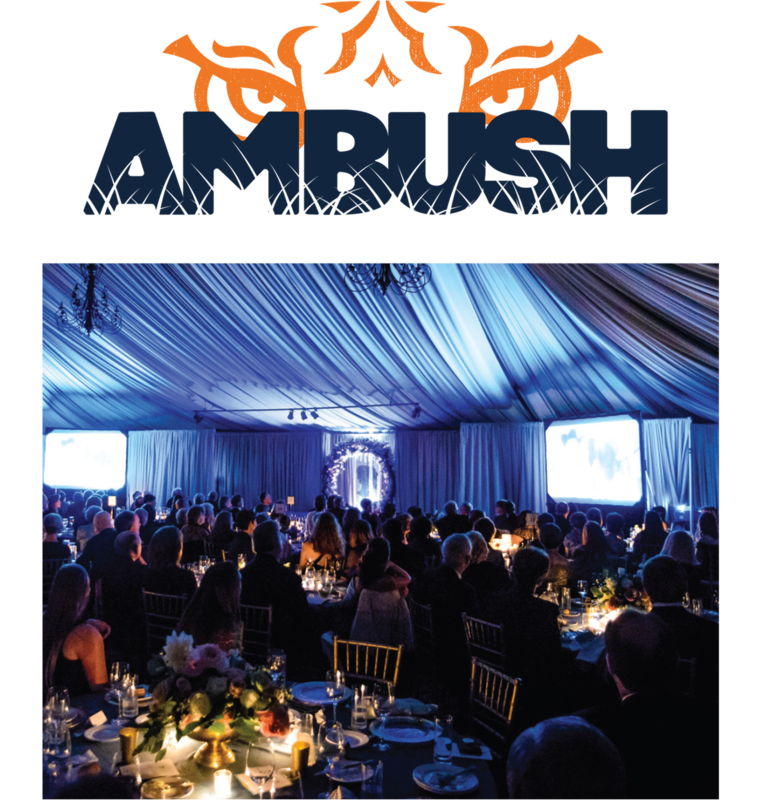 In this report, you will see the many ways our dedicated and hard-working alumni have supported the Auburn family – through funding scholarships, hosting Auburn Club gatherings and participating in community outreach programs. This year, we commemorated 125 years of Auburn women by bringing many facets of our university and community together to celebrate. Observances of this watershed moment in Auburn’s history included lectures, a gala, an art exhibit and a theatre performance. Our student alumni honored the official anniversary day with a party on historic Cater Lawn. 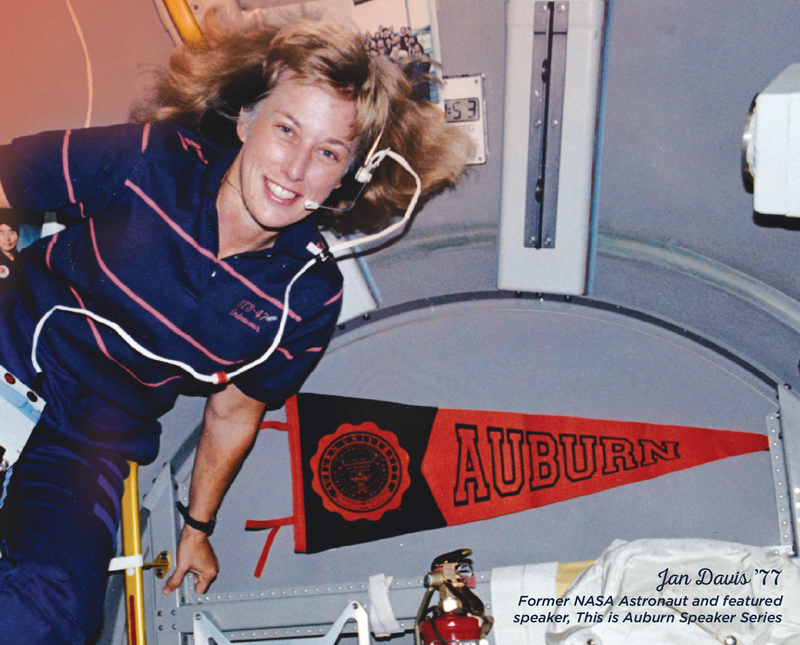 We also were fortunate to have hundreds of alumnae share their Auburn stories; these inspirational treasures are now preserved for future graduates and friends to enjoy. Each of you helped make the Auburn Alumni Association a vital and growing part of Auburn’s current and future success. Thank you for your volunteerism and your continued involvement in these important endeavors. Without your philanthropic support for our association, the programs benefitting students, our campus and alumni would not be possible. More than 30,000 alumni participated in events hosted by our more than 93 chartered Auburn Clubs and affiliates in 2016-2017. 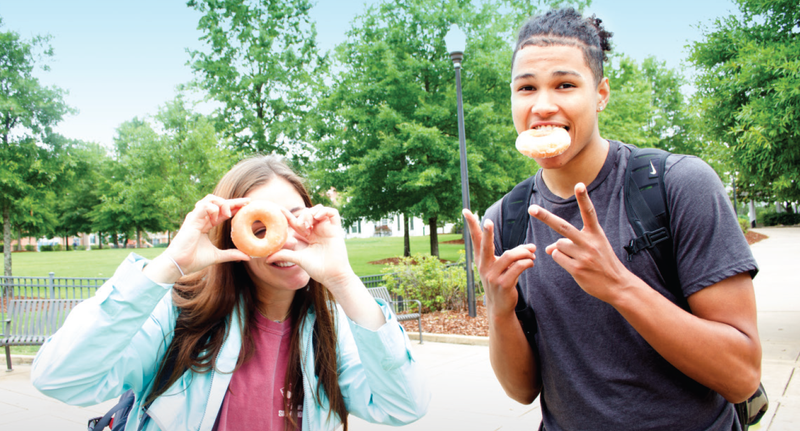 Through regular meetings, AMBUSH events with members of the AU coaching staff, Freshmen Send-offs, and game-watching parties, our clubs offered networking connections among their members and with Auburn. They also gave back, contributing more than $400,000 in scholarship funding in 2016-2017. An average of 1,000 people visited the Auburn Hospitality Tailgates prior to each of the home football games in 2016-2017. These tailgates connected alumni, families and friends back to Auburn by offering visits from Aubie, the War Eagle Girls and Plainsmen, the Auburn Cheerleaders and Tiger Paws. The association partnered with Auburn Athletics, PrimeSport and our Auburn Clubs to provide travel, accommodation packages and special events for away games. The Fall issue of our award-winning Auburn Magazine was sent to all alumni, reaching over 200,000 households. Our already strong social media presence on Facebook, Twitter, LinkedIn, Pinterest and Instagram grew to include a new social ambassador program, Bodda Getta Social, that lets users connect, share their Auburn spirit and win great Auburn gear. Our communication touch points for the 2016-2017 year was over 30 million engagements. In 2016-2017, the Auburn Alumni Association facilitated connections between alumni groups through events such as the Golden Eagles Reunion, which drew 180 alumni to campus for the induction of the Class of 1967 and Black Alumni Weekend, which brought 100 alumni to the university during A-Day Weekend festivities. Each year, the Auburn Alumni Association bestows its highest honor, the Lifetime Achievement Awards, to four deserving alumni. In 2016-2017, our honorees were Patrick Fain Dye, Nelda K. Lee ’69, Michael Scott Rogers ’81 and Dwight L. Wiggins ’62. K-Rob Thomas ’01 was recognized as the Young Alumni Achievement Award recipient. The Auburn Alumni Association is committed to engaging all alumni and friends through an inclusive membership program. All Auburn University graduates are welcomed as General Members of the Auburn Alumni Association. 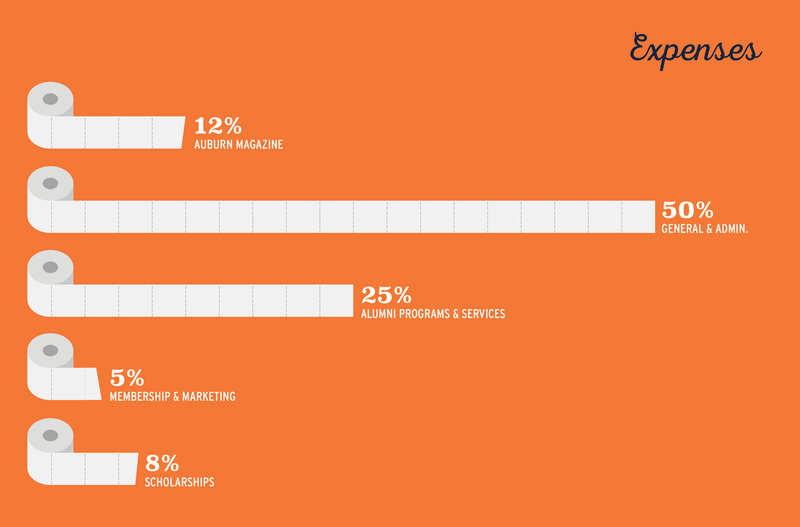 More than 42,000 graduates, alumni and friends support Auburn through annual or life membership contributions. 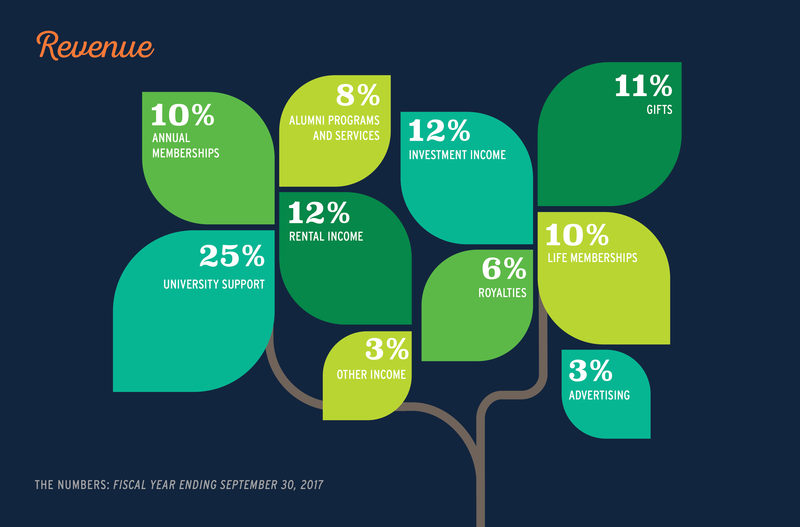 Contributions are 90% tax deductible and count toward Auburn’s alumni participation rate, which factors into Auburn University’s national rankings. 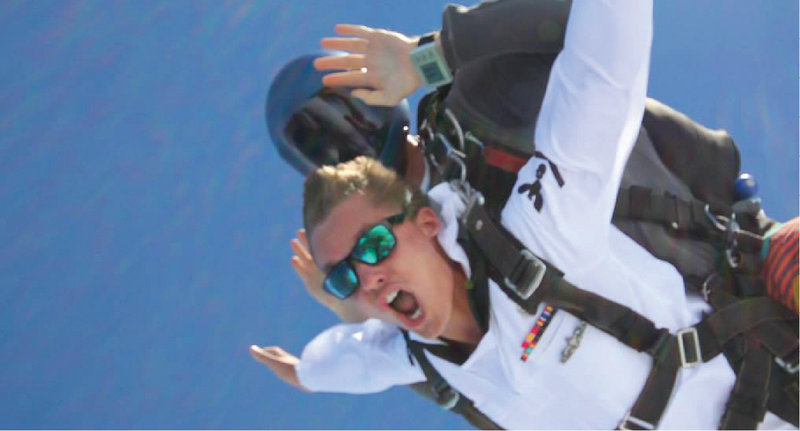 Contributing members receive upgraded benefits including an official membership packet with car decal, lapel pin, personalized membership card and the quarterly Auburn Magazine. Up to 25 five-year, non-renewable Alumni Professorships are sponsored by the Auburn Alumni Association, with funds endowed from annual giving. Faculty members are nominated by their deans and chosen on the basis of research, publishing and teaching. Up to three Undergraduate Teaching Excellence Awards are given to teachers who are nominated by students, alumni and colleagues in honor of their quality of teaching, knowledge of subject, interest in and availability to students, the impact the teacher had on the nominator’s personal educational experience and his or her influence within the Auburn community. 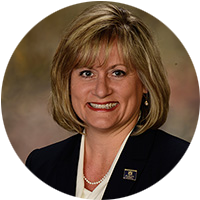 Jointly sponsored by the Auburn Alumni Association and the Auburn University Graduate School, the Distinguished Graduate Faculty Lectureship carries a $2,000 award from the association and is chosen by the Graduate Faculty Council. This year the Auburn Club Scholarship Program and the Auburn Alumni Association Endowment awarded 302 scholarships to students for the 2017-2018 school year. Our Alumni Walk paver program has brought in over $450,000 since its inception. The Circle of Excellence was established to help increase our endowment that is used to fund competitive scholarships to children of our association’s Life Members. 25 students were awarded scholarships this year as part of our Million Dollar Match program that raised over $1,250,000. In its maturity, this program will fund a minimum of 67 new endowments. The largest student group on campus, the student chapter of the Auburn Alumni Association has an average of 2,300 members. Led by a 25-student board, Student Alumni Association (SAA) provides students with the opportunity to interact with other students as well as Auburn University alumni and friends. SAA also works to raise funds for student scholarships. Last year, four scholarships were awarded to rising senior SAA members. 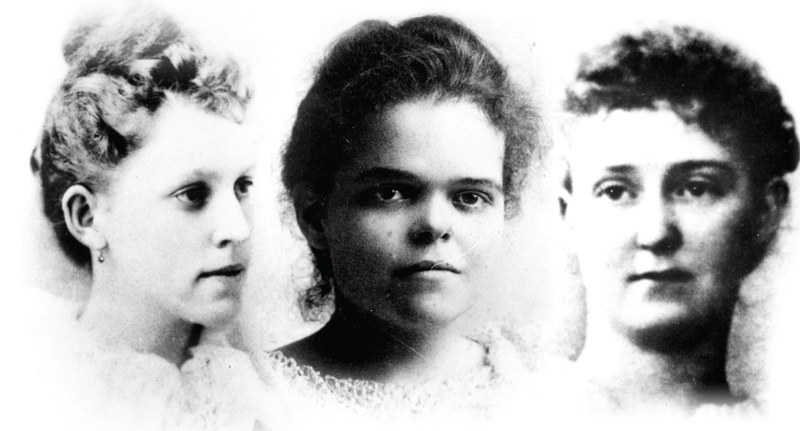 The 125 Years of Auburn Women celebration honored Willie Little, Katherine Broun and Margaret Teague, the women who first stepped onto this campus in 1892 and paid tribute to the thousands of women who walked through the door they opened. An art exhibit, performances, lectures and a wide variety of social events marked this momentous time in Auburn’s history, including a lawn party in front of Cater Hall and a glamorous gala under a luminous tented pavilion. 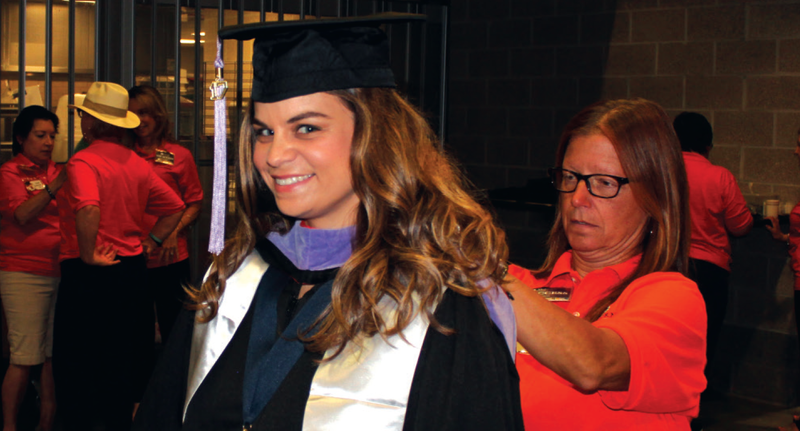 In May, December and August, the Auburn Alumni Association sponsored and staffed an area at commencement to help Auburn seniors get ready to don their caps and gowns. In 2016-2017, we provided new graduates with more than 8,000 bobby pins, more than 1,000 safety pins, more than 25 pounds of breath mints, hundreds of Band-Aids, numerous strips of double-stick tape, a photo backdrop and steamers to smooth out any wrinkles on this important day. The Auburn Alumni Association was an essential part of the university’s $1 billion Because This is Auburn: A Campaign for Auburn University through our Auburn Clubs, scholarship programs and communications. Our association’s strong efforts on behalf of this campaign brought our total dollars raised $11,433,912, far exceeding our initial $9.4 million goal. The Auburn Alumni Association worked with Auburn’s Office of Communications and Marketing and the Auburn Athletics Department in 2017 to present the “This is Auburn Speaker Series.” Distinguished faculty and alumni presented lively lectures on Friday afternoons before home football games, bringing more than 700 alumni and friends to the Auburn Alumni Center. War Eagle Girls and Plainsmen hosted campus tours following each of the lectures. 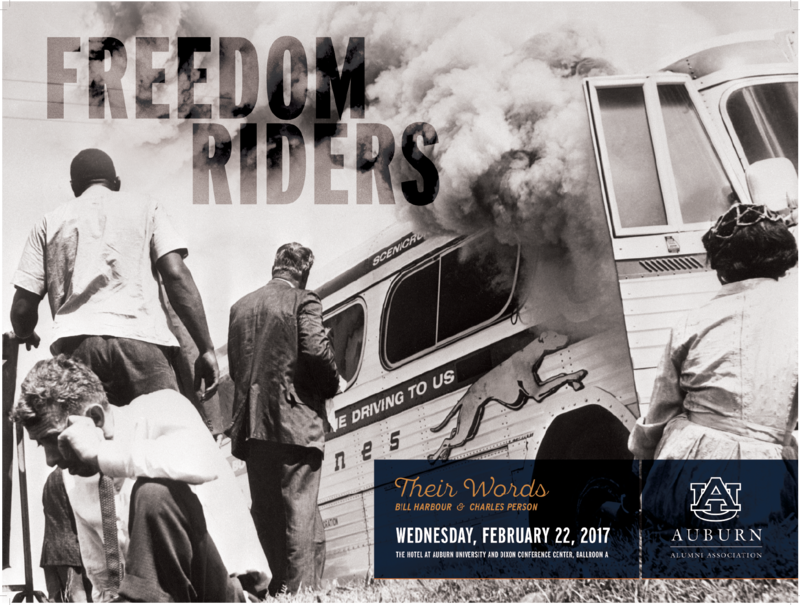 In recognition of Black History Month, the Auburn Alumni Association hosted Freedom Riders William Harbour and Charles Person. They shared riveting accounts of riding buses through the segregated southern United States as part of the civil rights movement. Along with an audience of 240, a live Facebook stream reached over 4,000 alumni and friends. 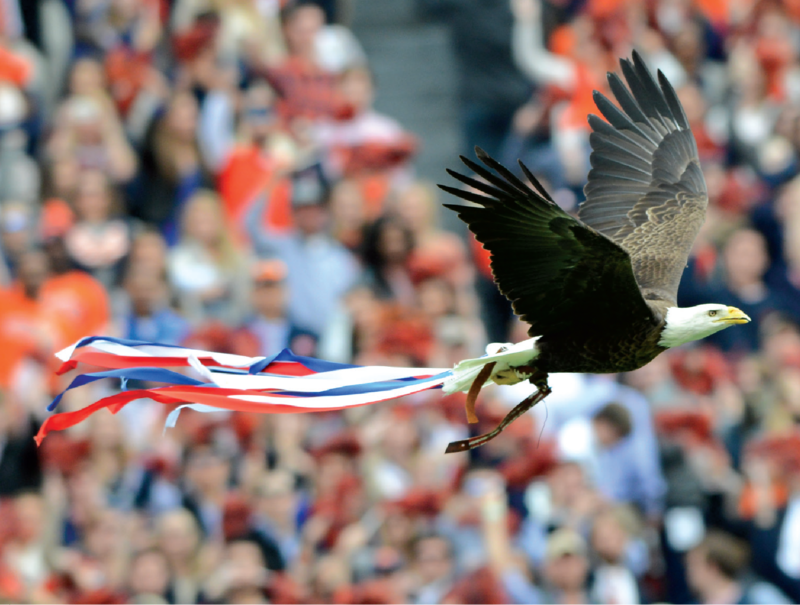 The Auburn Alumni Association saluted past and present military alumni during Military Appreciation Weekend in 2017. More than 2,000 commemorative coins were presented to military personnel at a Military Appreciation Reception with Auburn University Board of Trustees member and retired Army General Lloyd Austin ‘86, at an Auburn Hospitality Tailgate and at a FanFest on the Nichols Center lawn. The vision of the Auburn Family has been a centerpiece of Auburn culture for as long as you and I can remember. Merriam-Webster defines family as “a group of people united by certain convictions or a common affiliation.” At Auburn, we are united by our mutual love for each other and our beloved Auburn University – no matter our background or circumstance. 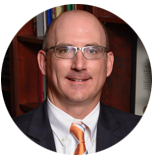 David Housel has famously said, “There are as many definitions of Auburn as there are Auburn men and women.” His words are worth remembering as we strive to carry that vision of family forward, for it is our crucial mission to ensure the inclusiveness of all Auburn alumni. Auburn University continues to take steps toward this vision. 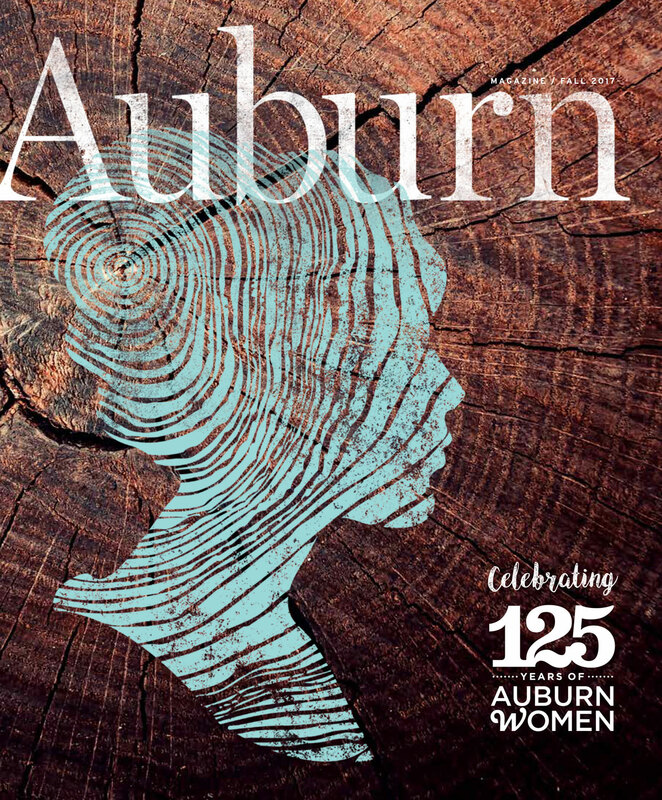 In 2017, we had a yearlong celebration of the 125th anniversary of the admittance of women, marking one of the most important moments in Auburn’s history. We also honored a turning point in our nation’s history by hosting William Harbour and Charles Person for a talk on their struggles as Freedom Riders during the Civil Rights Movement. The Auburn family is broad and beautiful – comprised of men and women, young and old. It includes people of many races, religions, sexual orientations and political philosophies. Those differences do not divide us but unite us because we all believe in Auburn and love it. We are the Auburn Family. all Auburn University alumni and friends. for and loyalty to the university.